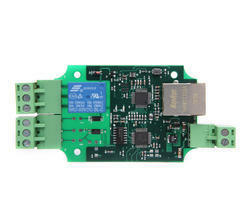 Providing you the best range of ethernet relay - aer-101 with effective & timely delivery. AER-101 is an Wide Supply Input, Ethernet Remote Relay Module, with 1-Input & 1-Output, and provide with both enclosed and open type housing. Its Ethernet connector provides 10/100baseT interface. It supports EasyBus-TCP, HTTP control, Auto ping and Internet control protocols, suitable for being used with servers, computers, mobiles, routers, etc., to provide remote control and monitor. You can also define the port number for HTTP by yourself, to realize Router Port Forwarding. With DHCP functions, it doesn't need to make any settings anymore in field. So just plug and play, power it on and then enjoy your remote control. AER-101 is a new generation product with more functions and higher stability. Control mode "toggle" and "automatic cycle operation" are provided additionally. Looking for “IOT Ethernet Input & Output Control”?